Enter the email address Sencia has assigned to you as your login name. 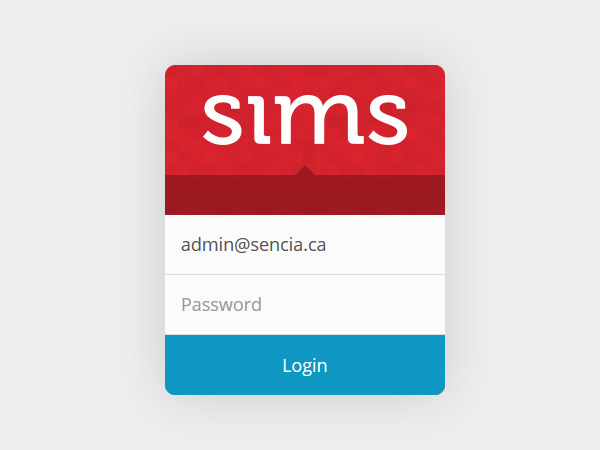 If you entered your information correctly, you should now be logged into your account, and the SIMS Main Interface will load. To log out of your SIMS account, click on the logout icon on the top right corner of the SIMS Navigation Panel. 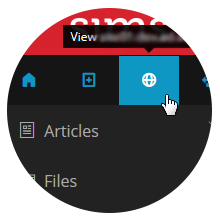 After you have logged in, you can quickly view your website at any time by clicking on the globe icon in the admin menu to the left. In the top left corner, beneath Admin Menu, you will notice a grey box indicating your SIMS Disk Usage percentage. Generally, approximately 30% is used by the SIMS application itself. To view a breakdown of your SIMS Disk Usage, click on the Details link. After clicking Details, the Detailed Disk Usage will be displayed. Depending on your SIMS package, the amount of space available here will be different. In this example, we have the SIMS SIlver package, which allocates you 2000 MB of Disk Space. In the image to the right, 2% of this 2000 MB has been used. If you are nearing 100% usage, you may wish to contact us to increase your Disk Space allocation. This percentage bar displays the amount of space used by templates that are stored on your website. A template is a content layout sample. For example, if you are a Realtor, and want all listings laid out in the same way, you would use a template to provide this consistency. Generally, Sencia provides templates to clients upon request for a nominal fee. This percentage bar displays the amount of space used by customizations that are stored on your website. Customizations are provided by Sencia upon request for a nominal fee. If you hover your mouse over a percentage bar, you can find out the exact amount of disk space used in each area.